*Includes Express Anytime Entry, Private Tented VIP Area with snacks and amenities, VIP Bathrooms + special surprises! *Includes VIP Express Entry, Balcony VIP Area with VIP Bar & Premium Snacks + Private VIP Backstage Restrooms & More! Join thousands of guys Pride Saturday to Party on the Pacific Ocean with the most stunning views of the Bay and the San Diego skyline, over the top production and Full Bars! *Our NEW Pier (right next to the old one) has even more outdoor space & increased capacity! 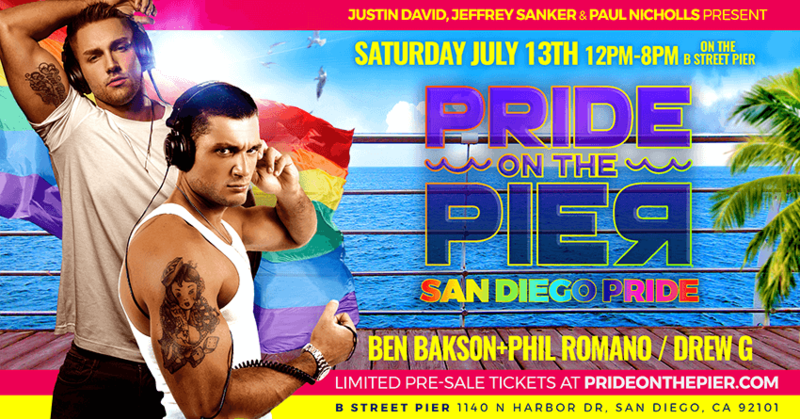 Superstar International DJs BEN BAKSON & PHIL ROMANO, Warm Up Set by DREW G, Pride on The Pier Dancers + Special LIVE Performance! First 500 tickets just $49! - Secure your spot today! Upgrade to VIP for just $20 and get Express Anytime Entry, Private Tented VIP Area with snacks and amenities, VIP Bathrooms + special surprises!